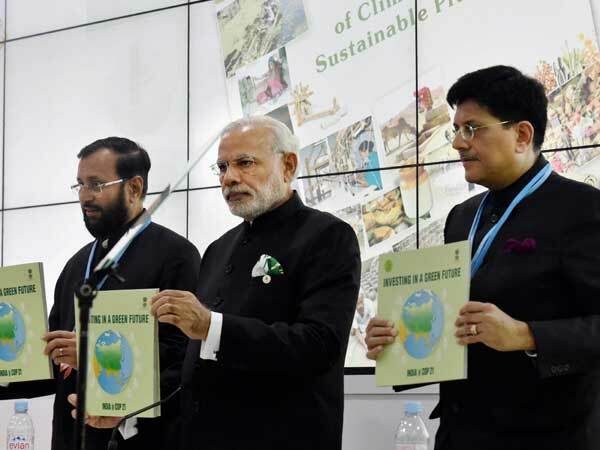 In view of its commitment to its Nationally Determined Contributions as per the Paris Accord on Climate Change, India has pledged that by 2030, 40 per cent of installed power generation capacity shall be based on clean sources and 175 GW of renewable energy capacity will be installed by 2022. This includes 100 GW from solar, 60 GW from wind, 10 GW from bio-power and 5 GW from small hydro power. The substantial higher capacity target will ensure greater energy security, improved energy access and enhanced employment opportunities. With the accomplishment of this ambitious target, India will become one of the largest Green Energy producers in the world, even surpassing several developed countries. A total of around 73.35 GW of renewable energy capacity has been installed in the country as on October, 2018 from all renewable energy sources which includes around 34.98 GW from Wind, 24.33 GW from solar, 4.5 GW from Small Hydro Power and 9.54 GW from Bio-power. Further, projects worth 46.75 GW capacity have been bid out/under installation. The government has declared the trajectory of bidding 60 GW capacity of solar energy and 20 GW capacity of wind energy till 31.03.2020. Projects worth each 30 GW solar power and 10 GW wind power capacity would be bid out each in the year 2018-19 & 2019-20. This has given assurance to the renewable energy developers & investors community about long-term commitment and planning by the government in the RE sector encouraging them to make risk-free investments in the country. *India holds 5th position for overall installed renewable energy capacity, 4th position for wind power and 5th position for solar power in the world. n Registered lowest ever solar tariffs in India of Rs 2.44 per unit in reverse auctions have been carried out by the Solar Energy Corporation of India (SECI) in May 2017, for 200 MW and again in July, 2018, for 600 MW. Registered lowest ever wind tariff of Rs.2.43 per unit in a tender of 500 MW project has been by the Gujarat government in December 2017. *The cumulative renewable energy installed capacity has increased from 35.51 GW as on 31.03.2014 to 73.35 GW as on 31.10.2018 (increase of around 106% during last four & a half years). The capacity addition of over 37.84 GW grid connected renewable power has been achieved during the past four and a half years (2014-15 to 2018-19) which includes 21.7 GW from Solar Power, 13.98 GW from Wind Power, 0.7 GW from Small Hydro Power and 1.5 GW from Bio-power. *A total of 101.83 billion units of power were generated in the country during the year 2017-18 from all renewable energy sources as compared to 61.78 billion units generated in 2014-15 (increase of around 65% during last four years). Share of renewable energy in terms of overall power generation has reached around 8% from 5.5% in 2014-15. Further, 62.66 BU of energy is generated during 2018-19 up to August 2018. The government has revised the target of Grid Connected Solar Power Projects from 20,000 MW by 2021-22 to 100,000 MW by 2021-22 under the National Solar Mission. *The country currently has the fifth highest solar-installed capacity in the world with total installed capacity of 24.33 GW as on October, 2018 against a target of 100 GW by 2022. Further, 22.8 GW capacity is under implementation or have been tendered out. *The Ministry plans to bid out remaining solar power capacity in 2018-19 and 2019-20, so that bidding gets completed for entire 100 GW capacity additions by March 2020, leaving two years’ time for execution of projects. *The tariff for grid-connected solar power projects is determined through competitive bidding process involving reverse e-auction. This has helped in bringing down the tariff significantly. The lowest solar tariff discovered in India is Rs 2.44/kWh in July 2018 in ISTS-based bidding. The solar tariff has come down from around Rs 18/kWh in 2010 to Rs 2.44/kWh in 2018 due to factors like economies of scale, assured availability of land and power evacuation systems etc. *Solar Parks are being set up in the country. 47 solar parks of aggregate capacity 26,694 MW have been approved in 21 states up to November 2018. Over 1,00,000 lakh acres of land has been identified for various solar parks out of which over 75,000 acres have been acquired. Solar projects of aggregate capacity 4195 MW have been commissioned inside various solar parks. *The Ministry is also taking up projects for new emerging technologies such as floating solar power. The country currently has the fourth highest wind installed capacity in the world with total installed capacity of 34.98 GW as on October, 2018 against a target of 60 GW by 2022. Further, around 9.4 GW capacity is under implementation or have been tendered out. *The Ministry plans to bid out 10 GW wind power capacity each year for 2018-19 and 2019-20, so that bidding gets completed for entire 60 GW capacity additions by March 2020, leaving two years’ time for execution of projects. *The recent assessment conducted by National Institute of Wind Energy (NIWE) indicates a gross wind power potential of 302 GW in the country at 100 metres above ground level. *The capacity additions till 2017 were through Feed-in-Tariff (FiT) mechanism. Subsequently, the tariff regime has been shifted from Feed-in-Tariff (FiT) to bidding route. *The government has issued ‘Guidelines for Tariff-Based Competitive Bidding Process for Procurement of Power from Grid Connected Wind Power Projects’, vide Resolution notified on 8 December, 2017, to provide a framework for procurement of wind power through a transparent process of bidding. This has resulted in discovery of lowest ever tariff for wind power. *The National Wind-Solar Hybrid Policy was issued in May 2018. The main objective of the policy is to provide a framework for promotion of large grid connected wind-solar PV hybrid system for optimal and efficient utilisation of wind and solar resources, transmission infrastructure and land. The wind - solar PV hybrid systems will help in reducing the variability in renewable power generation and achieving better grid stability. *A bid for setting up of first 1200 MW Greenfield wind solar hybrid project was floated by SECI. *The National Offshore wind energy policy was notified in October 2015 with an objective to develop the offshore wind energy in the Indian Exclusive Economic Zone (EEZ) along the Indian coastline. *Initial studies carried out by NIWE indicate offshore wind energy potential off the coasts Gujarat and Tamil Nadu. *LiDAR was commissioned on the monopile platform in November 2017 at Gulf of Khambhat, off Gujarat coast for wind resource assessment. *NIWE floated Expression of Interest (EoI) for establishment of 1 GW offshore wind farm in Gulf of Khambhat region off Gujarat coast. 35 parties (both national and international) showed interest. *National targets for offshore wind capacity additions of 5 GW by 2022 and 30 by 2030 declared. *The expansion of the wind industry has resulted in a strong ecosystem, project operation capabilities and a manufacturing base. State-of-the-art technologies are now available in the country for the manufacture of wind turbines. All the major global players in this field have their presence in the country. Over 24 different models of wind turbines are being manufactured by more than 12 different companies in India. Wind turbines and components are being exported to the US, Australia, Europe, Brazil and other Asian countries. Around 70-80% indigenisation has been achieved with strong domestic manufacturing in the wind sector. The Ministry of New and Renewable Energy has been promoting Biomass Power and Bagasse Cogeneration in the country in order to utilise the country’s available biomass resources like bagasse, rice husk, straw, cotton stalk, coconut shells etc. for power generation. *Waste to Energy projects are also being set up for generation of Energy from Urban, Industrial and Agricultural Waste / Residues such as municipal solid wastes, vegetable and other market wastes, slaughterhouse waste, agricultural residues and industrial wastes & effluents. *A total capacity of 9.54 GW of grid connected bio-power has been installed in the country as on October 2018 against a target of 10 GW bio-power by 2022. This includes 8.73 GW from bagasse cogeneration, 0.68 GW from non-bagasse cogeneration and 0.13 GW from waste to energy. A total capacity of 4.5 GW of grid connected small hydro power has been installed in the country as on October 2018 against a target of 5 GW small hydro power by 2022. Further, 126 no. of projects of capacity 0.73 GW are under various stages of implementation. Energy Storage is one of the crucial & critical components of India's energy infrastructure strategy and also for supporting India's sustained thrust to renewables and electric mobility. Aiming to strive towards leadership in the energy storage sector by creating an enabling policy and regulatory framework, a comprehensive National Energy Storage Mission (NESM) has been developed. The Mission focuses on demand creation, indigenous manufacturing, innovation and necessary policy support for proliferation of Energy Storage in the country. The Ministry is implementing off grid and Decentralised renewables programme for meeting energy demand for cooking, lighting, motive power, space heating, hot water generation, etc. The Ministry also supports deployment of decentralised solar applications like solar lanterns, solar street lights, solar home lights, solar pumps, etc. in the country. As on October, 2018, over 40 lakh lantern & lamps, 16.72 lakh home lights, 6.40 lakh street lights, 1.96 lakh solar pumps and 187.99 MWp stand alone have been installed in the country. The MNRE has decided to scale-up its R&D effort to Technology Development and Innovation Programme. The focus is on promoting application-oriented innovation, integrated with research and development for commercial applications and testing and standardisation for quality and reliability assurance in renewable energy sector. A Technology Development and Innovation Policy (TDIP) is also being finalised. It is based on a robust ecosystem for support for research, innovation and validation for technology development and demonstration, testing and standardisation, awards for innovation linked with start-ups.